Analysis of data returned by the Cassini spacecraft, which orbited Saturn for 13 years, confirms the existence of giant dust storms in the equatorial regions of Saturn’s largest moon, Titan. The finding makes Titan the third world in our solar system that is known to harbor dust storms (the other two being Earth and Mars). Sebastien Rodriguez of the Universite Paris Diderot in France led a team of scientists who studied bright regions that showed up in infrared images of Titan’s equatorial regions captured during the large moon’s northern equinox in 2009. Sometimes viewed as an analog of early Earth, Titan has a hydrologic cycle but, rather than being constituted of water – methane is the driving substance. For this reason, Rodriguez and his colleagues initially interpreted the bright regions they saw near Titan’s equator as methane clouds. Such clouds do form at Titan’s equinoxes, when the Sun passes directly over the moon’s equator. This produces methane clouds and storms in the moon’s tropical regions, which were imaged by Cassini. However, an in-depth study of these bright regions indicated they are not caused by methane clouds, which form at much higher altitudes than than these features, seen just 6.2 miles (10 km) above Titan’s surface. “From what we know about cloud formation on Titan, we can say that such methane clouds in this area and in this time of the year are not physically possible. The convective methane clouds that can develop in this area and during this period would contain huge droplets and must be at a very high altitude, much higher than the 10 km that modeling tells us the new features are located,” Rodriguez explained. The chemical signatures of these bright areas do not match those of methane or lava ice, both of which would be visible on Titan’s surface for much longer than the 11 hours to five weeks these features were observed. Using computer models, the scientists determined the bright features are located in Titan’s atmosphere but very close to its surface. Their position directly above equatorial dunes indicates they are clouds and storms of dust raised from the dunes by surface winds. Produced by chemistry in Titan’s atmosphere, complex organic molecules grow in size until they fall to the large moon’s surface, only to subsequently be lifted from large surface dune fields. “Titan is a very active moon. We already know that about its geology and exotic hydrocarbon cycle. Now, we can add another analogy with Earth and Mars: dust storms,” Rodriguez said. Dropped onto the surface of Titan in 2005, the Huygens probe obtained just one measurement of surface wind, which was very low. 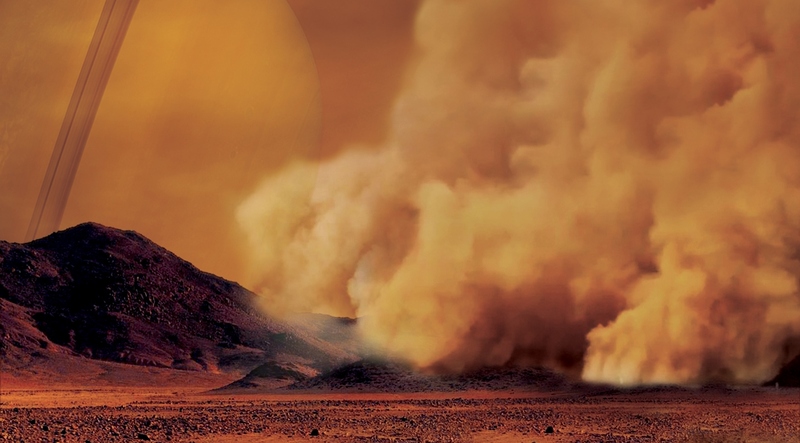 Rodriguez and his colleagues believe Titan’s surface winds are far more powerful than Huygens measured, strong enough to raise dust storms and carry dust over large distances. A similar phenomenon occurs on Earth, with dust clouds often arising before storms in dry areas. Findings of the study have been published in the journal Nature Geoscience.